The foundation is done on Job's house! The tin and wood for the roof has been bought and delivered. David delivered the last of the 700 cement blocks this morning. Now he is delivering the rest of the sand needed to mix with the cement. It's coming along...slowly but surely the community is starting to volunteer and help their neighbors rebuild. ***On a cool side note...go back and look at the middle picture. The guy standing to the right in the dark green shirt is a Voodoo priest in the area we are building in. Yesterday when we were delivering block he watched the others unload it but when when came back with the second load he helped! I had no idea who he was but the long beard was a red flag as beards are not normal in Haiti. He is young and normal looking-not at all what I expected from a Voodoo priest. David came and told me who he was. At first I panicked (Voodoo is NO joke). But then realized what an opportunity we have here. I didn't go knocking on his door...he came to us. To check us out...and then started helping. After the blocks were unloaded he walked over to me and asked how much money I was going to pay him. In my sweetest Southern Girl Creole accent I asked him who asked him to help us. He cracked a smile and said, "I know if white people are doing a project there is money. Where's mine?" I told him to ask the other workers if we were paying them and they said no. Someone explained what we were doing and about Job's house burning down. It was time to go so I told him we would be back with another load in the morning if he wanted to help. Even I rolled my eyes at this suggestion b/c I already knew the answer. But, he said he thought he would have time. I am working in the office today and I can't wait for David to get back and tell me if he showed up. It's funny the way God works...well not funny but you know...different than how we would. It's like a ladder of what ifs? 1st rung: What if I hadn't gone to nursing school? 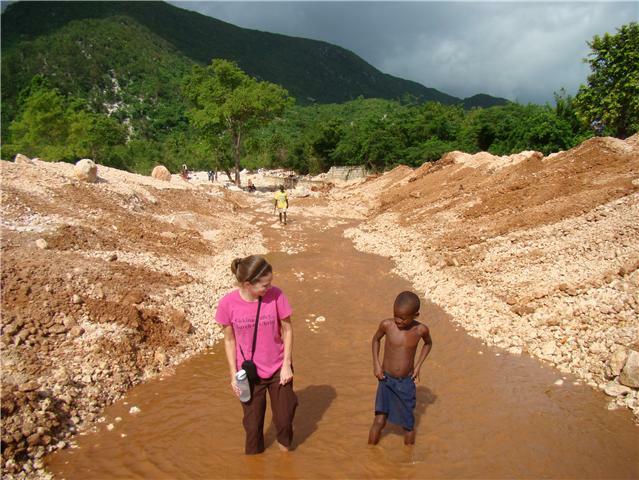 2nd rung: What if I hadn't come to Haiti? 3rd rung: What if Job's house didn't burn down causing me to meet them? 4th rung: What if I would have gotten discouraged and left Haiti? God is amazing. His plan is more intertwined than a spider web. Sometimes we are fortunate enough to see parts of it unfolding and stand in amazement with our mouths hanging open. Other times we don't understand and can be frustrated, discouraged and mad. What reassurance to know that God is weaving the web of our lives. What a day it will be to sit in heaven and see the web untangled and see purpose. Please be in prayer for us as the project is completed. And, as always, thanks to the donors who made this possible. You are just as much a part of this web as those of us here. Thank you so much for sharing these pictures and the updates. I can't wait for heaven, when we can see how all of these tangled webs were a part of God's tapestry. Miss you, girl! !